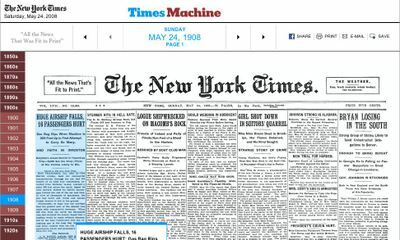 TimesMachine can take you back to any issue from Volume 1, Number 1 of The New-York Daily Times, on September 18, 1851, through The New York Times of December 30, 1922. Choose a date in history and flip electronically through the pages, displayed with their original look and feel. The newspaper features advertisements from the time, which I love because they provide such a clear snapshot of ordinary life. I was surprised to see that The New York Times logo font looks almost the same (if not exactly) as it is now. So many interesting features to notice! I hope the NYT continues to add issues after 1922 in the same format. Recommended uses: highly justifiable time wasting, background research for works of historical fiction, and getting perspective on the "big picture" (the more things change, the more they stay the same). The catch: it's available online only to home subscribers of the NYT. However, it can be accessed by everyone at their local library through ProQuest's Digital Vault. The TimesMachine site features only a few teaser issues at the moment.